Personal injury is something that is caused due to the negligence or harmful intention of others. People suffer from many types of personal injuries. Right from falling down a damaged stairs that has been left unrepaired to getting injured due to mechanical errors everything is personal injury. There are many factors that can affect your legal efforts for claiming compensation for the personal injury you suffer. Get in touch with the best personal injury law firm in New Haven, CT for all legal help you require with regards to personal injuries. 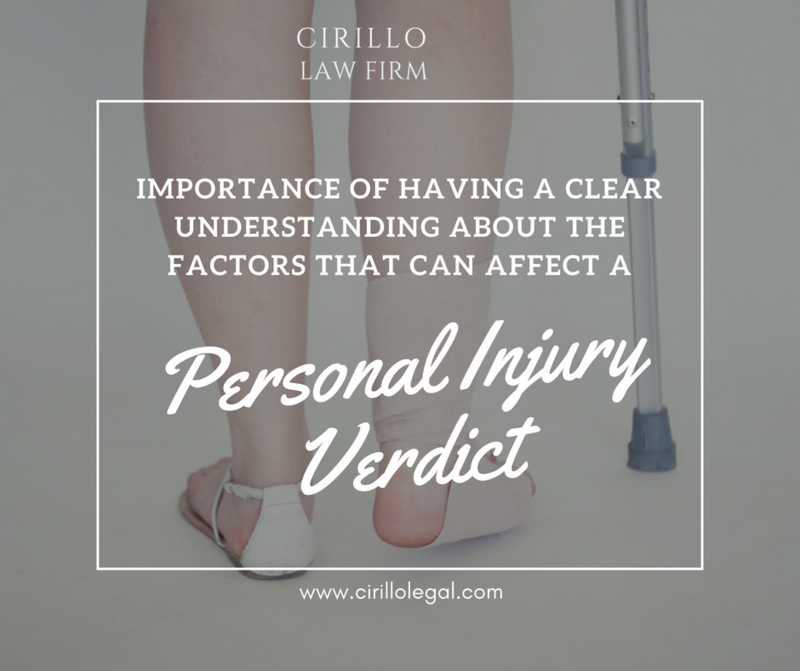 Having said the above, it is important to have a clear understanding about the factors that can affect a personal injury verdict. - Location of injury affects the quantum of compensation offered to a specific type of injury based on the importance and precedence. - Location where the case hearing happens also impacts a personal injury verdict depending on their restrictive limitations. - The Medical practices carried out during treatment for the personal injury experienced matters most for a positive personal injury verdict. - If more number of people is involved in the accident that caused personal injury, the quantum of compensation may get affected. Cirillo Legal is considered as the best personal injury law firm in New Haven, CT, who is established with an experienced team of personal injury lawyers. The expert legal professionals ensure every client receives appropriate solutions for all their grievances pertaining to personal injury. The experience Cirillo Legal carries with it in sorting out personal injury related disputes makes it the best personal injury law firm in Connecticut. Get in touch with CirilloLegal for all your personal injury related legal issues and get rid of the same quickly.